HTC HD7 Review - Learn everything you need to know about the HTC HD7 before you buy. -The HTC HD7 is a premium smartphone. 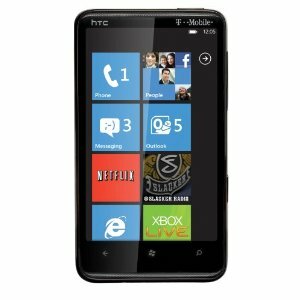 Now, you have to like the Windows Phone 7 OS, but if you are a fan, this is the phone for you. We have grown to love the Windows Phone 7 OS and all its minimalist design qualities. It has a massive 4-inch display that shoots good HD 720p video. And this huge screen is great for texting, reading and viewing video. It has a kickstand for landscape viewing on a table, but it’s terribly unstable. Overall, the HD7 is a great phone, the 4-inch display will draw a lot of people in, but the user will have to decide for him/her self whether or not the Windows Phone 7 OS is right for them. -Well, it’s hard not to miss the design. Sleek and minimalist, the actual aesthetics of the phone are pretty awesome. There are a few design flaws such as the kickstand. Great idea, poorly implemented. It’s offset to the left side so if you bump the right side at all while using it, it topples. Anyway, the phone has a dedicated camera button that you can hold while the phone is locked and it will take you straight to the camera-pretty cool. The speakers on the phone are located on the top and bottom in little recessed slivers. To have the speakers in more than one place is great, but recessed? Not so great. Gathers dust easily, impossible to clean but, but it does look great doing it. -The Windows Phone 7 OS is the main source of multimedia on the phone. It offers cool features like the highly customizable tiles on the homepage, the social networking app that compiles all your networks into one screen and just the overall coolness of well designed OS. The camera takes good pictures and shoots video at 720p. The only complaint about the video camera is in the settings. For some reason, it defaults to shooting video in 420, and you have to change the settings every time you use the camera. I’m sure they will fix this soon, but currently it’s a bit annoying. -The battery life is not so great. Going a full day with normal to heavy usage will probably require another battery charge. It officially gets 6.5 hours of talk time and that’s pushing it. -Additional features? Well, the phone itself doesn’t offer anything else that any other WP7 phone doesn’t. It has Bluetooth, Wi-Fi, and GPS. WP7 also allows you to wirelessly push media to Wi-Fi enabled devices. As far as the phone goes, the display isn’t phenomenal (although it’s still huge), and it handles WP7 just fine. Again you’ll have to decide if the HTC HD7 WP7 OS is for you (And if that was too many acronyms, that’s High Tech Computer corporation HD7 Windows Phone 7 Operating System). "I have been very pleased with the service PaceButler has provided for our company. The process for returning phones is an easy process, and the checks are received quickly. I have always received a followup email making sure we have received check. "